Sorry for this super late post this week. My computer broke down and I was trying to edit the video in another computer, but without any avail. Then finally when I decide I would post without the video, the website kept crashing on me…anyway, I am finally putting up this weeks card, althought there is still no video. I do have the footage and once I get it editted I will add it to this post. I got the inspiration for this card from a wedding outfit that my cousin wore at her reception. I had imagined the card to come out a lot prettier and gorgeous….but couldn’t quite make it so. Making the card was quite simple, probably one of the quickest ones that I have made. I used a Hero Arts large backgroud stamp called “flourish background“. I masked off the rectangular greeting area with a post-it note and then stamped and gold embossed. Then I simply stamped the greeting and gold embossed. The flowers are punch outs of a small daisy punch. I used the same technique as in the previous card to make them look 3-D. Finally I used Sakura stardust clear pen to color in the centers of the flowers and some parts of the flourishes. what are you talking about, the card is beautiful! In fact, it’s flawless! The card is gorgeous – as is your cousin. What a fabulous inspiration and execution of the idea, Tasnim!! This is soooo beautiful ❤ MA! OMG, this is where your road to the Runway Inspired blog started! Lol. I think the card is beautiful. Love this and I can see why you were so inspired. Beautiful bride. I may try this using the brides colors. I believe its olive green and salmon. Thanks for sharing. Great day! 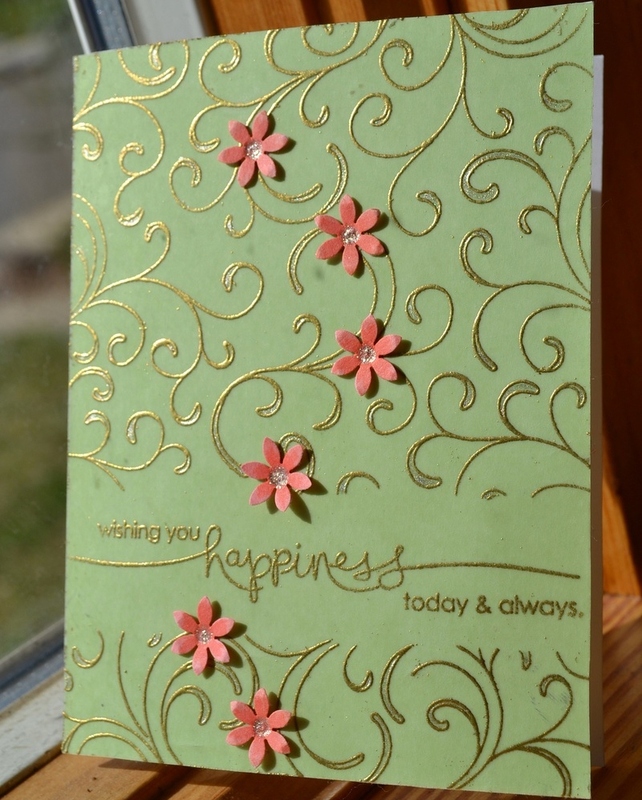 What a beautiful interpretation of your inspiration…..I love the gold embossing!